For those of you who follow my makeup journey on Instagram (@kimmmy5), you’ll already know that I tend to opt for a bronzer when contouring, instead of a creamy palette. The sole reason being that… besides the Sleek MakeUp palette, I haven’t found a creamy formulation which sits nicely on my skin. 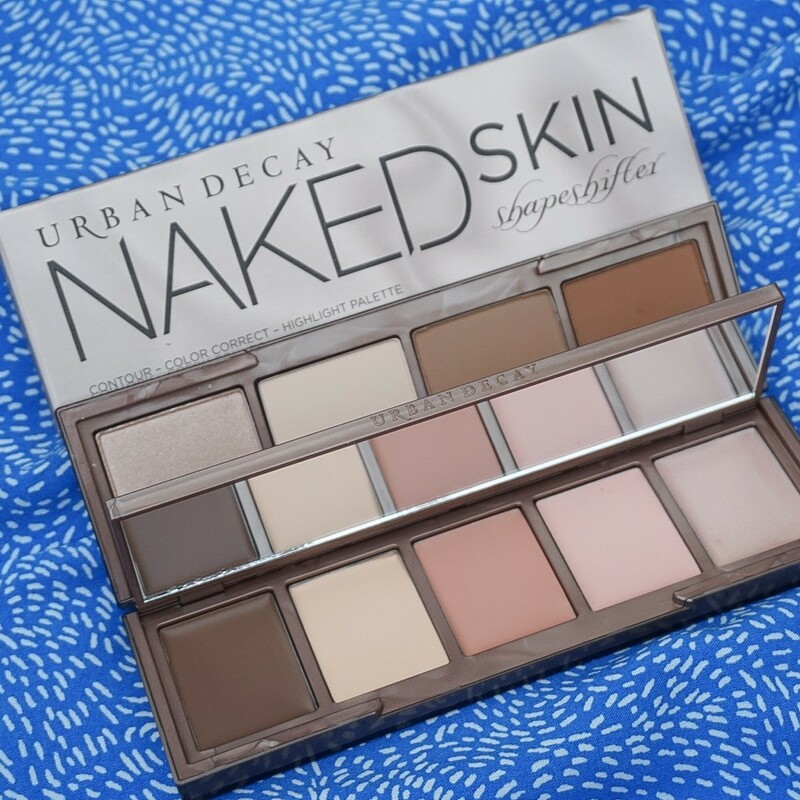 Today I had the privilege of testing the Urban Decay Shapeshifter palette in ‘Light Medium’, courtesy of the PR team. Before I go-ahead and reveal my first impressions, I just want to let you know that Shapeshifter isn’t just a contour palette – it’s an all-in-one go-to face product which includes five creams (two contour shades, two colour correctors and a highlighter) and four powders (three contour shades and a highlighter). All for the price of £40. First impressions of the creams? When I dipped a narrow foundation brush into the creamy formulation (starting with ‘light contour’ and later applying ‘dark contour’) I found that the product had a fairly streaky texture. As much as I buffed with this brush, the consistency wasn’t looking any smoother. After a little while, I decided to switch my brush for a trusty beauty blender and began to pat the creamy formula into my skin. This instantly softened any harsh lines and removed my fearful first impressions. For best results, I really recommend applying the creams with a stippled foundation brush or beauty blender… and PLEASE remember, a little product goes a long way; the cream is fairly ‘heavy’ and hard to blend if you apply too much at once (the same applies to any creamy contour). So, I actually forgot to test out the two creamy colour correcting shades and highlighter on my face today, however, I did swatch all 5 shades on my arm. I have the fairest complexion, so it’s definitely a challenge to find ‘light contour’ shades which make my under-eyes pop… without them being a pure white shade. Therefore, the ‘Light Contour’ was a little yellow-tinged against my complexion. While it definitely blended into the rest of my skin-tone, I really hoped it would ‘pop’ a little more. ‘Dark Contour’ – while it might look like the oddest choice for fair skin-tones (it’s VERY dark looking in the pan), it actually blends out nicely with a little time and persistence. It added depth to my cheeks without looking too dramatic, which I really liked. The ‘Colour Corrector’ is a pure orange-peach pigment which I’m definitely going to test beneath my concealer, to see if it makes a difference, while the alternative colour corrector (which can also be applied as a highlight base), has a much pinker tone to it. ‘Pearl Highlighter’ is a really subtle glowy shade, which is hard to pick-up on the camera, but I’m sure would add extra definition to the powder highlight afterwards. Well, a product being too pigmented has never really been a problem for me in the past. When I initially took the shade ‘Medium Contour’ onto the brush, I didn’t anticipate how dramatic a few swirls of the pan would look on my cheek. I also found that this shade had a bit of a deep-orange tinge to it, which I would usually try and stray away from as much as possible. From first impressions, I’ve definitely realised that I need to apply the smallest amount of product to a dense or fluffy brush in the future. This will help the little fallout issue I had from swirling too much product in the pan. What about the Dark Contour powder? Having tested the Medium Contour, I knew it would be way too intense for my skin-tone, so I dusted the Light shade beneath my eyes. While it didn’t make a hugely dramatic impact, I felt like my eyes did open-up and look more awake. Can we just TALK about the Pearl Highlighter?! While the contour shades being extremely pigmented was a reasonable problem for me to begin with, it is this pigmentation which makes the highlighter SO special. As soon as I swirled the brush onto my face, the pigment instantly clung to my complexion and while this sometimes has the potential to enhance skin imperfections, I found that the glistening shade was really flattering against my pale skin. It also lasted the ENTIRE day, which is so rare for me – I’ve tried so many highlighters, both high-end and drugstore, and I’ve never discovered one this long-lasting before! I know I’ve been a little tough on this palette today, but there are so many benefits to using it. Now that I know the best way to apply each element, from experience, I’m definitely going to find it easier to create a softer look second-time around. I know this review was a little lengthy, but hopefully it helped you guys out! Please let me know your thoughts in the comment space below.